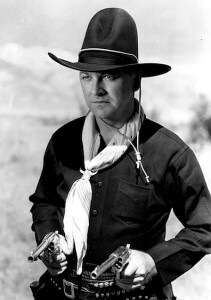 Boyd as he looked in the first film. The first series entry, Hop-a-long Cassidy, was released on August 23, 1935. Within weeks it was playing in thousands of theaters, most of them owned by Paramount. Reviews were positive but not especially enthusiastic; Variety, for example, called the film “not overly exciting” but allowed that it “moves along smoothly, without going in too heavily for usual horse-opera dramatics.” Nonetheless, the movie-going public immediately took to Hoppy – who, by the way, earned his nickname in the third reel by catching a bone-shattering bullet in the leg while rescuing his fellow Bar 20 puncher, hotheaded young Johnny Nelson (played by James Ellison). When the first six films proved successful, Paramount brought the series in house, increasing the budgets and paying Harry Sherman a salary while giving him complete autonomy to produce the pictures as he saw fit. The studio released six Hopalong Cassidy Westerns per “season” (the period beginning roughly around Labor Day and extending through the following year’s Memorial Day) until 1942, when distribution of the series was transferred to United Artists, at that time suffering an acute product shortage. His career reinvigorated, Boyd initially resisted being typed as a “B”-Western star but eventually accepted the new reality. He got his personal life in order too, divorcing fourth wife and drinking buddy Dorothy Sebastian in 1936 and marrying Paramount contract player Grace Bradley the following year. Grace had developed a schoolgirl crush on William Boyd after seeing The Yankee Clipper (1927), one of his DeMille-produced PDC films. The Brooklyn-born Bradley was still a teenager – and a stunningly beautiful one at that – when she entered show business herself, performing in Broadway musicals and coming to Hollywood in 1933 as a Paramount contractee. She still adored Bill Boyd, even after the scandal that cost him his RKO contract. Upon learning this, Boyd asked the star-struck actress on a date in early May of 1937. (When he called Grace at home, she initially balked, convinced that he was an imposter put up to phone her as a gag.) The ensuing whirlwind courtship culminated in their marriage on the fifth of June – Bill’s birthday – exactly 75 years ago yesterday. None of Boyd’s previous four unions lasted more than six years, but Grace stuck by him through good times and bad. Their storybook romance ended only with his death in 1972, after 35 years together. 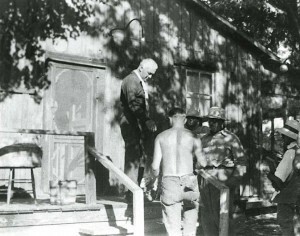 Boyd and crew members between scenes. Grace is credited with keeping Bill on the straight and narrow. He never entirely gave up drinking, but she kept him from going off the rails, even when he became depressed after Harry Sherman stopped producing the Hopalong Cassidy Westerns in 1944. By that time Bill had played his slicked-down version of Clarence Mulford’s rough-hewn cowboy hero in 54 feature-length movies. He doubted any producer in Hollywood would ever cast him in another role. Scraping together every last dollar, Boyd bought out his old producer, who had retained a financial interest in the character. Then he renewed Sherman’s distribution deal with United Artists and produced another dozen Hopalong Cassidy films for theatrical distribution, six for 1946-47 and six for 1947-48. Bill tried to freshen up the series by changing sidekicks, injecting strong mystery elements, and even discarding his trademark black outfit. But his self-produced Hoppy entries, lacking verve and panache, failed to reap box-office rewards. Broke again, his feature-film career over, William Boyd turned to a new medium called television. The big studios were initially constrained from releasing their libraries to TV by the complaints of exhibitors, who feared movie fans would quit going to theaters if they could get major Hollywood motion pictures in their homes on the small screen. In the late Forties and early Fifties, product-hungry commercial stations were programming old, independently made American “B” movies and British imports. So, in 1949, Boyd licensed the first 54 Hopalong Cassidy Westerns – his self-produced efforts were still making their theatrical rounds – to the NBC network, which aired them in prime time. A new generation of youngsters discovered Hoppy via TV, and within a couple years Bill was back on top. Cannily but carefully, he doled out limited-term rights for a slew of licensed products featuring Hopalong Cassidy. His image appeared on shirts, pajamas, blankets, lunch pails, pocket knives, coloring books – just about every kid-oriented consumer product you can imagine. In 1952 he produced a half-hour series for network broadcast. The first 12 episodes were cutdowns of Bill’s 1946-48 features; the remainder found him once again in the familiar black outfit with well-known character actor Edgar Buchanan playing Cassidy’s saddle pal Red Connors. That same year he briefly went back to work for his old mentor, Cecil B. DeMille, making a cameo in the latter’s star-studded, Oscar-winning The Greatest Show on Earth. 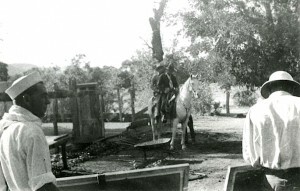 Boyd and Ellison on horseback, ready to shoot. The Hoppy fever eventually broke, but not before making Bill and Grace very wealthy. Childless (Bill’s five marriages produced only one child, a son born to third wife Elinor Fair; tragically, the boy died in his infancy), they retired to California’s Palm Desert in 1953 but remained socially active until the late Sixties, when Bill’s health began to fail. In 1968 he underwent surgery to have a cancerous tumor removed from his lymph gland, and refused to appear in public following that disfiguring procedure. By that time Boyd had contracted Parkinson’s Disease, and he died in 1972 with beloved wife Grace at his side. She enjoyed a healthy and active later life, passing away on September 21, 2010 — her 97th birthday. I could say a lot more about Bill, Grace, and Hoppy. But this post is already way longer than I intended, so it’ll keep. Meantime, let’s recognize William Boyd’s 117th birthday and the 75th anniversary of his marriage to Grace. Around 1949 we had one of the early rental TVs, the ones where you put in a quarter and received one hour of TV programming. All my quarters were spent on westerns and Hop-a-long Cassidy was one of my favorites. I also watched FRONTIER PLAYHOUSE at 5:00 pm every day. My allowance had to be less than a buck a week at 8 years old, so I now wonder where I managed to get all those quarters. I guess I whined and begged for my parents to keep feeding the TV. My dad bought a TV here in Wisconsin in 49 & I remember seeing Hoppy & Lone Ranger. I also remember after we moved to Arkansas traveling back & forth to visit my sister the motels had those pay TV’s for 25cents.Hoppy has always been my favorite cowboy.